Fried Fish with Celery - You can adapt to the kind of meat as you like. It's easy to make and we guarantee that it will be your favorite dish. With concentrated flavors of celery, ginger and stir to combine well with snake-head fish that crisp outside and soft inside. 1. Mix tapioca, salt with fish meat and set aside. 2. Cut celery into 2 inches long piece. Then cut half a chilli and chop garlic coarsely. 3. Heat the oil. Fry the fish until golden and bring up to set aside. 4. Fry chilli, garlic with oil. Add salted bean paste, oyster sauce, water, chopped ginger and stir well together. Add fish meat to stir just a little. Finally add celery and stir well to combine. Ready to serve. 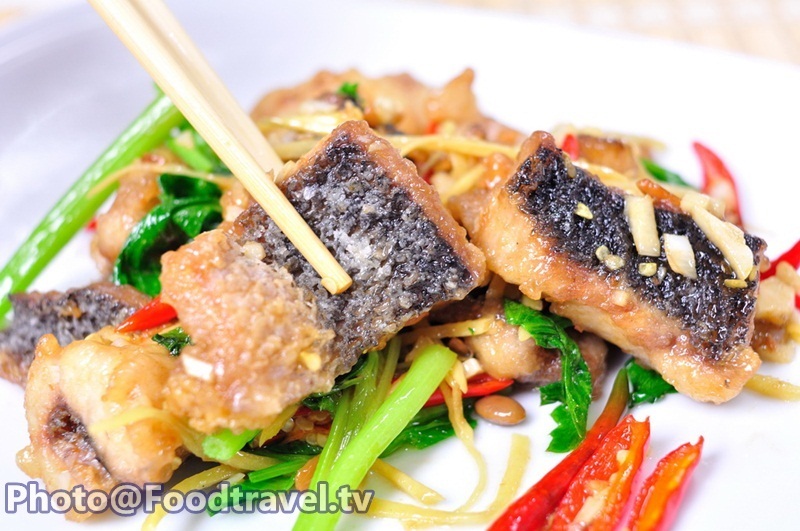 Fried Fish with Celery - You can adapt to the kind of meat as you like. Its easy to make and we guarantee that it will be your favorite dish. With concentrated flavors of celery, ginger and stir to combine well with snake-head fish that crisp outside and soft inside.